Join Xocai as a new Distributor! While you're here... Visit these Chocolate MLM Business Partner Sites! Got Xocai Chocolate MLM Business Opportunity Questions? Join Xocai as a Preferred Customer! is poised to hit momentum. MXI Xocai’s record speaks for itself! MXI Xocai is only 7 years old, family owned, and completely debt free! Year to year sales growth continues to provide Xocai Distributors with inpressive residual income opportunities! Way ahead of the “dark chocolate” trend, the Brooks family founded Xocai on the knowledge that chocolate can contain all the natural nutritional firepower of cacao. sweetened with Agave Nectar to achieve a low glycemic index. 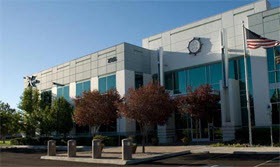 Xocai’s expansive new 75,000 sq.-foot corporate facility is an indicator both of the company’s success and its commitment to its distributors. 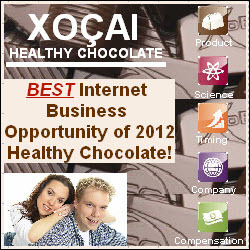 Today, having now intensified their efforts to perfect a delicious and highly effective chocolate with Xoçai, the Brooks decided to market Xocai Healthy Chocolate via a highly successful network marketing business model - providing home based business entrepreneurs an opportunity to earn their share of payouts totalling 50% of combined sales approaching $1 billion. In addition, Xoçai is a debt-freecompany with a distributor retention rate among the highest in the industry. Here's Your Ultimate Chocolate MLM Business Opportunity Resource Center!